Whiteboard Coder Off-TOpic: If I'm taking Social Security and working will my SS increase? If I'm taking Social Security and working will my SS increase? My mother-in-law started taking her full Social Security when she turned 70 in 2013. She also has continued to work since then and pay more into Social Security. 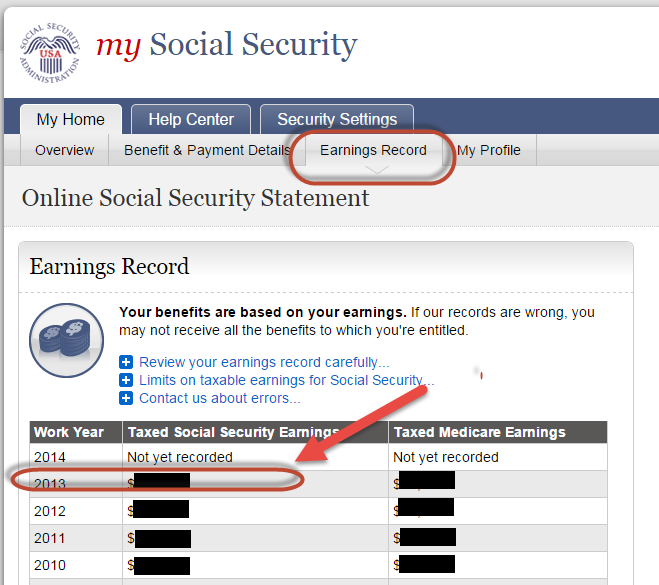 In 2013 I spent some time researching the question "If I'm taking Social Security and working will my Social Security monthly payments increase? And if so by how much? Here is the article I wrote up at the time http://offtopic.whiteboardcoder.com/2013/10/how-much-will-my-monthly-benefit-go-up.html . This article will be a redo of my calculations based on what has actually happened. I was close in my last article but wrong on a few points, like were to round down. As a side note it takes some time for the changes to take effect to your Social Security Payments. It was not until December of the following year that my mother-in-law's Social Security check changed. The check she received from SS in December looks odd. They increased her December check by $65.00 when by my 2014 calculations , which are not in this document, it should have been $64.80. They also gave her a credit of $650 which looks a lot like $65 multiplied by 10 months. It looks like they back paid her for the 2014, like they should have, but they paid $65 X 11 rather than $64.80 X 12. If I am correct I believe SS owes her $62.60. So how much of an increase? It's January 2015, as I write this. This year everyone who was taking S.S. Last year will see a 1.7% bump in their benefit amount. 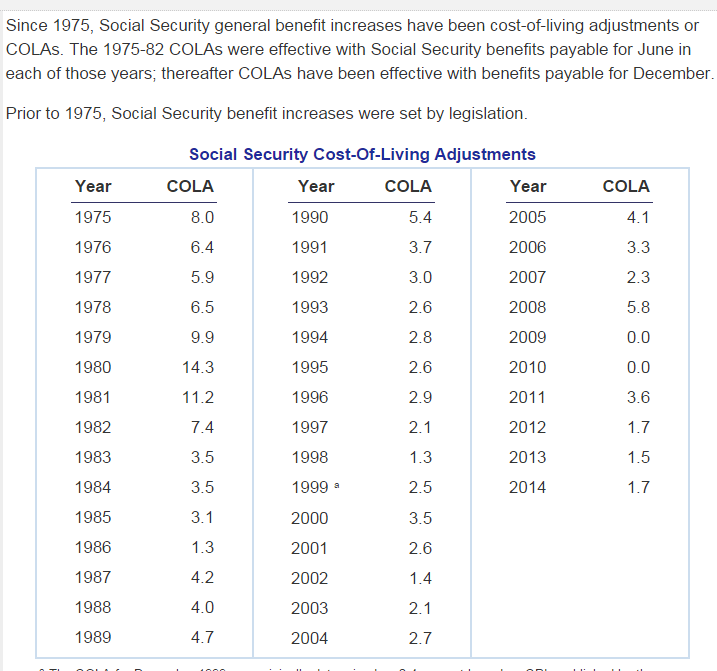 Based on the COLA (Cost of Living Adjustments) Listed on the S.S. page here http://www.ssa.gov/oact/cola/colaseries.html . If I take my mother-in-laws monthly payment from SS from last January of 2014 and multiply it by 1.017 (accounting for COLA increase) and then I subtract that from the amount she is actually getting this month I come up with $65.90. This is the increase she will get based on her income in 2013. I just want to prove that my calculations will come out with the same figure. Here is the equation I came up with last time to figure out the Increase in SS. Now how did I come up with all the variables and calculate their values? The income is the Taxed social Security Earnings. If you log into your Social Security account at http://www.socialsecurity.gov you can find this number. Click on the earnings Records to get a list of your earnings. I blanked out my Mother-in-laws amounts but you can see where I got the number. If you have than 35, or fewer, earning years STOP and enter 0 for Low. If she had earned $4,000 in 1951 she would multiply that by 12.167 and get $48,678 (bringing the amount she made in 1995 up to 2005 equivalent dollars). Retirement Age. What age did you actually retire? 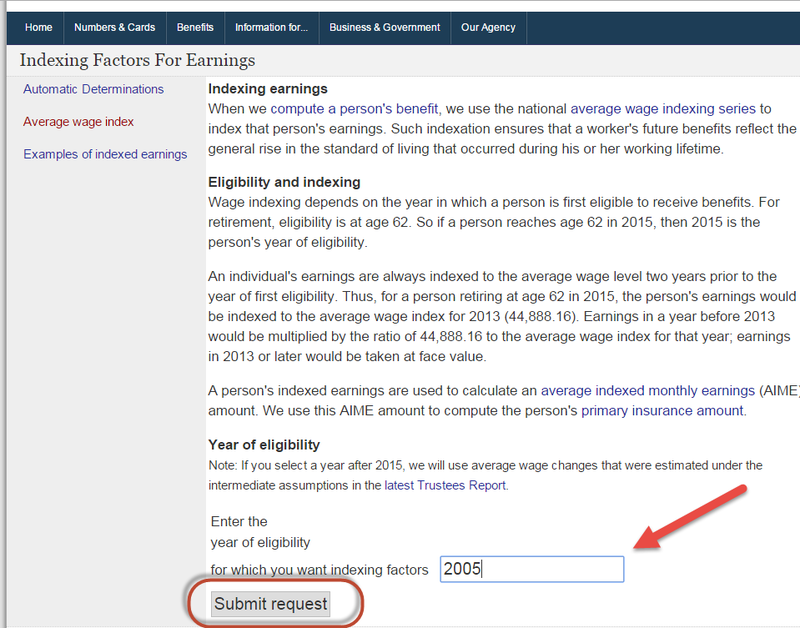 This page http://www.ssa.gov/retirement/1943.html  will show the RA factor to use if you retire before age 66 and you were born between 1943 and 1954. 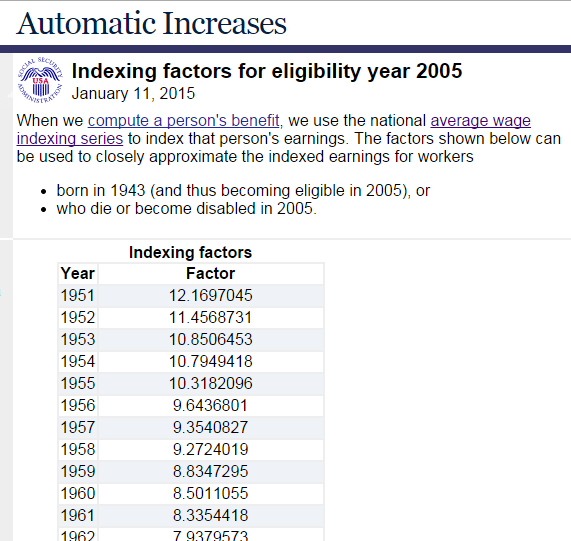 This page http://www.ssa.gov/retire2/1943.htm  will show you the RA factor to use if you retire after age 66 and you were born between 1943 and 1954. Social security has income brackets, also known as bend points, are points at which SS reduces how much they pay you based on your earnings. The first small bracket pays you 90% the second pays 32% and the 3rd bracket pays 15%. Write down the number from the 1st bracket and the 2nd bracket for the year you turned 62 from this table. My mother-in-law turned 62 in 2005 so I will write down. The first bracket needs to be multiplied by 0.90 (90%). The second bracket needs to be multiplied by 0.32 (32%). Both numbers need to be multiplied by your ColaF and RA numbers. If your monthly Social Security payment is under the Calculated 1st bracket your Bracket = 90%. If her Social Security where under ($942.20 + $2019.2) = $2961.40 she would use 32% and if it were over she would use 15%. Her current SS payments puts her in the middle so her bracket is 32%.